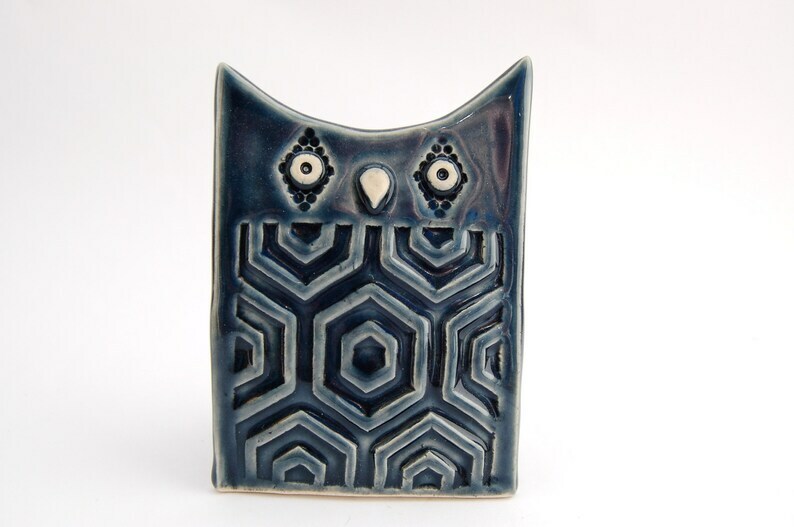 Hector is a deep navy blue ceramic owl sculpture with clean, modern lines and a hexagonal chest design. A diamond shaped, textured button was used behind his sprigged pupils. Hector's beak was formed by hand and attached in the same way as his eyes. He was glazed all over with a custom mix of obsidian and sky blue celadon high gloss glazes that achieved his deep navy color that accentuates the textural elements throughout his stylized form. Glaze was wiped away from his eyes and beak for contrast. Hector is a sturdy little fellow, measuring 3.75 inches tall, 2.5 inches wide and 1.5 inches in depth. He is sleek and super shiny with a sweet, bright face.